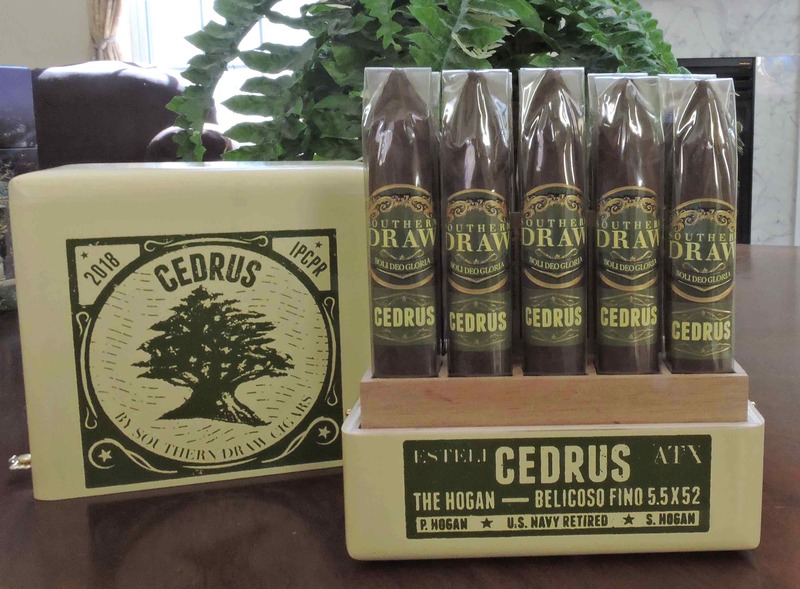 Cedrus is the fifth regular production premium line by Southern Draw Cigars. It’s a cigar that was announced just prior to the 2018 IPCPR Trade Show and Convention, and was officially shown to the world at the trade show at an unveiling event the first day. Compared to its other lines, Southern Draw took a different approach – releasing only the first size in the blend. The size was a box-pressed belicoso – also something different for a first release by Southern Draw. The vitola is officially called The Hogan – and it pays homage to Phil and Shelly Hogan. The Hogans are close friends of co-owners Robert and Sharon Holt, and were instrumental supporting the efforts of launching Southern Draw Cigars. Today we take a closer look at Cedrus – The Hogan. While the previous four core blends paid homage to different flowers, Cedrus pays homage to Lebanese Cedar trees. Lebanese Cedar trees (Cedrus libani) were highly sought after for ancient woodworking. 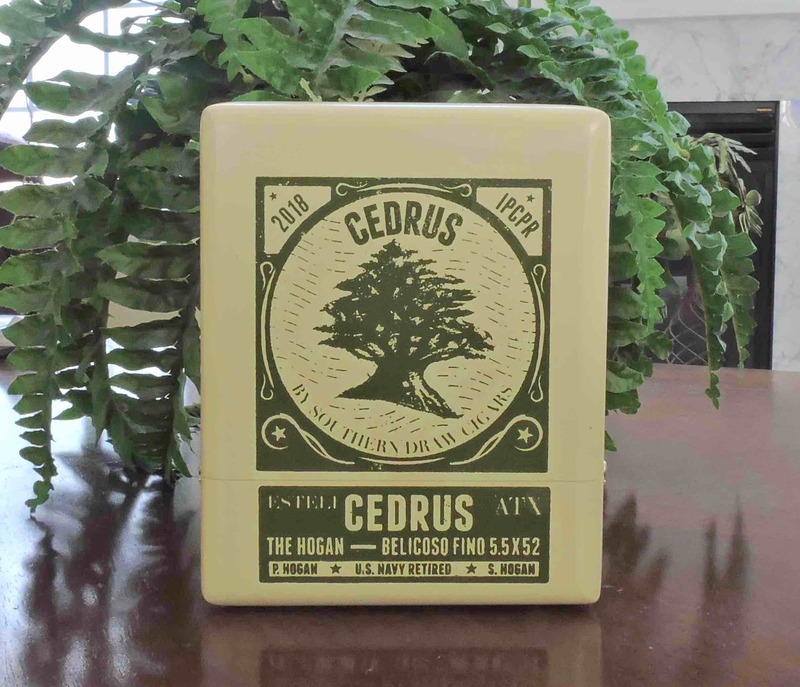 Cedar is currently the most utilized wood in the premium cigar industry and the image of the Cedrus tree serves as a biblical inspiration behind Cedrus’ brand art. In addition to the vitola name paying homage to the Hogans, there is also a connection to the cedar tree. The name Hogan also happens to be the name of a Western Red Cedar tree that grows in the Pacific region of the United States known as The Hogan. This is a tree can grow to 200 feet tall and live to over 1,000 years old. 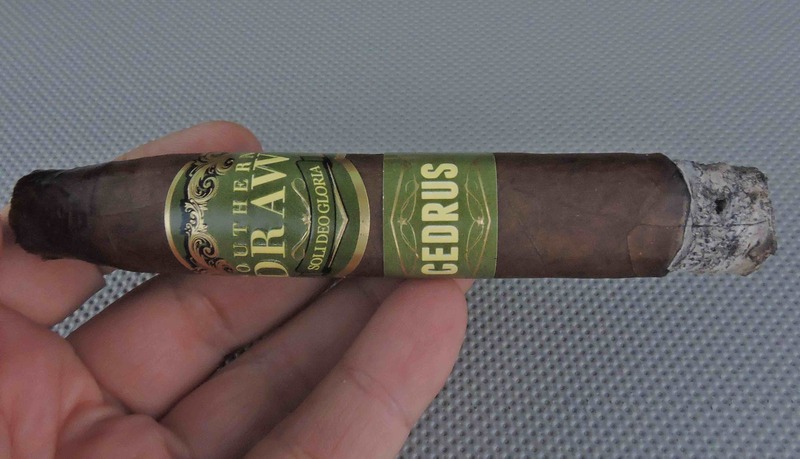 Without further ado, let’s break down the Southern Draw Cedrus – The Hogan and see what this cigar brings to the table. My snapshot of the CEDRUS blend transports us to the ancient soils of Indonesia, a place aptly named the “Spice Islands” where we have methodically selected this rich, reddish brown colored wrapper. As this cigar burns, a savory perfume of what I consider nutmeg, toasted clove, cinnamon and cedar aromas compliment the naturally fermented tobacco tastes and awaken my palate, an intentional profile representing the diverse Asian food cultures explored (and enthusiastically shared) by the Hogans during and after their 20 year service in the U.S. Navy. Playing a supporting role to the unique spice profile is the medium bodied strength and semi-sweet chocolate notes of classic Dominican Republic and Nicaraguan tobaccos. A retrohale offers me a more powerful burst of hard-wood charcoal, red/white pepper and herb-like notes that stem from tobaccos of the lesser known high mountain region of Quilalí, Nicaragua. As mentioned, the Cedrus represented several firsts for Southern Draw. The Indonesian-grown wrapper is something Southern Draw has not done before. 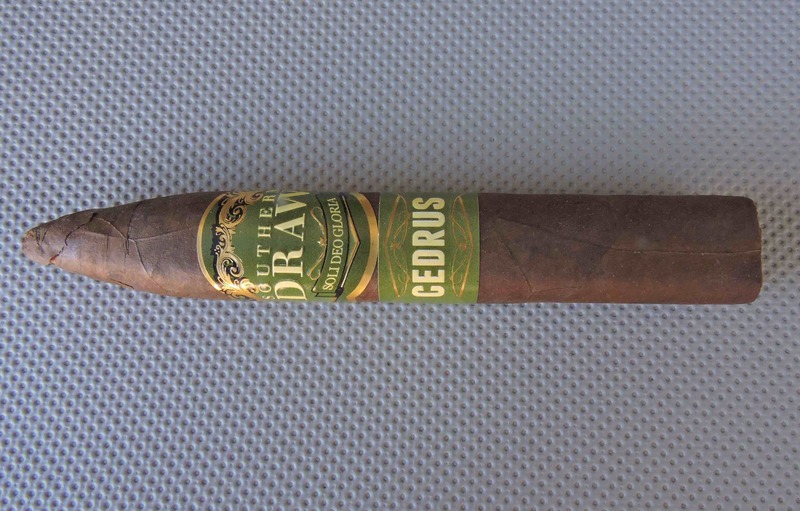 As with all Southern Draw Cigars, Cedrus is produced at AJ Fernandez’s Tabacalera Fernandez. The Indonesian wrapper is not something the Fernandez factory is well-known for. Currently, the only size that has been released by Southern Draw for The Hogan is a 5 1/2 x 52 box-pressed Belicoso Fino. The cigars are packaged in a unique ten-count box. For 2018, a production of 60,000 cigars has been allocated. There will be 5,000 individually numbered boxes along with an additional 1,000 ten-count refill bundles. From the distance, the box almost has the appearance of the bundle. The top lifts off and shows ten Southern Draw Cedrus Hogan cigars that are arranged in the upright position. The boxes of the first iteration of the Cedrus Hogan were each individually numbered. The Indonesian wrapper of the Cedrus Hogan had a rich chocolate brown color. There was a nice coating of oil on the surface of the wrapper. This was a relatively smooth wrapper with any visible veins on the thin side and minimally visible wrapper seams. The belicoso had a gentle taper toward the tip. The box-press was a firm square press. There are two bands on the Southern Draw Cedrus. The bands incorporate the coloring scheme introduced at the 2017 IPCPR Trade Show. The primary band has an army green background with gold frame. On the band is the text “SOUTHERN DRAW” in pale yellow text. Below the text is an army green-colored ribbon-like design with the text “SOLI DEO GLORIA” (which is Latin for Glory to God alone) in a pale yellow font. The remainder of the band has gold adornments. On the left side of the band is the text “AGED” while on the right side of the band is the text “HAND MADE” – both in pale yellow font. There is also a secondary band located just below the primary band. The band also has an army green background. The center of the band has the text “CEDRUS” in pale yellow font. There are gold adornments across the whole band. The green background is slightly lighter to the left and right of the CEDRUS text. Given the Cedrus Hogan is a belicoso, a straight cut was used. For this cigar experience, the Credo Special T cutter with the 36 ring gauge hole was used to get an ideal cut for this figurado and take advantage of the taper. The next step was to commence the pre-light draw. The dry draw delivered a mix of chocolate and mineral notes. While it was a simple pre-light draw, it was very satisfying from a flavor standpoint. At this point, it was time to light up the Cedrus Hogan and move into the smoking phase. Out of the gate, the Cedrus Hogan delivered more notes of chocolate and mineral. There also was some white pepper and a touch of cedar. Early on the chocolate and mineral notes became primary while the spices settled in the background. As the Cedrus Hogan moved through the first third, the mineral notes subsided and chocolate notes became primary. The chocolate notes also had a citrus sweetness joined to it. This was more of a subtle sweetness that never became too sweet, nor too acidic. Meanwhile the retro-hale had layers of black and white pepper as well as a touch of cedar. The second third saw the chocolate/citrus combination remain in control. At this point, there was a gradual increase in the mineral and pepper notes. The pepper notes slowly morphed into more of a classic black pepper note. Toward the end of the second third, the mineral notes returned to the forefront, joining the chocolate/citrus combination. The last third didn’t see many changes. The chocolate/citrus and mineral combination remained grounded as the primary notes. The pepper notes increased a little more, but still remained secondary. There also were still touches of cedar present in the background. This is the way the Cedrus Hogan came to a close. The resulting nub was firm to the touch and cool in temperature. The Cedrus Hogan performed quite well when it came to its burn. While there was a slight amount of curvature from time to time on the burn line, the cigar had no problems maintaining a straight burn path and really didn’t warrant many additional touch-ups above the norm. This was a cigar with a firm ash that had a salt and pepper color scheme to it. The burn temperature was ideal. The burn rate was a little slow (it took an average of about 102 minutes to smoke this cigar). This slower burn rate had no adverse effects other than prolonging the smoking time. I found the Cedrus Hogan had a draw that struck a nice balance between openness and resistance. The tip of the belicoso remained quite firm with the smaller ring toward the head never getting plugged. There was also a very nice body of smoke produced throughout this smoking experience. The Cedrus Hogan is a cigar that could easily be classified as a medium strength, medium-bodied cigar. In fact, I would put the intensity levels smack in the middle of both scales. I found the Cedrus Hogan remained pretty constant in terms of the intensity levels for strength and body, not producing much in the way of variance. Both the strength and body balanced each other nicely with neither attribute overshadowing the other. The first batches of the Southern Draw Cedrus Hogan began to hit many retail shelves in September. Since then I have smoked several of these cigars. With about two months time passed, I assess the Cedrus Hogan to be a cigar that has greatly benefited from additional time in the humidor. It’s a well-constructed cigar and while it’s not a cigar that undergoes radical flavor transitions, it does deliver some very nice flavor. Given an Indonesian wrapper with a cigar named “Cedrus”, my expectations was a cedar-forward flavor profile. This turned out to not be the case – and that was a good thing. Finally, I found the box-pressed belicoso fino format of the Cedrus Hogan worked quite well. This is a cigar I could recommend to a novice or experienced cigar enthusiast. As for myself, this is a cigar I would reach for and smoke again. The way it’s smoking now, it garners box worthy consideration.